It always used to be quite hard to find men’s shirts at charity/thrift shops, at least where I live. I think it was because men, bless them, being less preoccupied with fashion trends than women used to wear their shirts until they wore out and were in no condition for anything but the rag-bag. I’m not sure what has happened over the last couple of years but I am suddenly seeing a lot more men’s shirts in the shops than ever before. 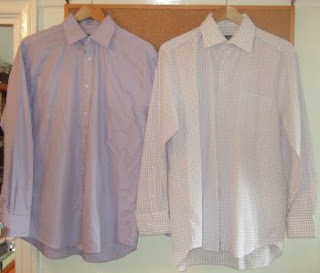 Not old tatty ones that have been lurking in the wardrobe for a decade or more but nice, fairly new, obviously expensive and remarkably unworn shirts. Maybe men are becoming fashion conscious and don’t want to be seen wearing ‘last year’s colour’. One is by Daniel Hechter, the other Thomas Nash and I imagine they would be at least £20 each new. I paid £3.99 each! My husband is thrilled and not the least worried that lilac may be so last season!